Finger Limes are rainforest plants from northern NSW & southern Qld. that are grown as far south as the Victorian Mornington Peninsula. Trees may grow from 2 metres to 10 metres, so be prepared to prune to your desired size. 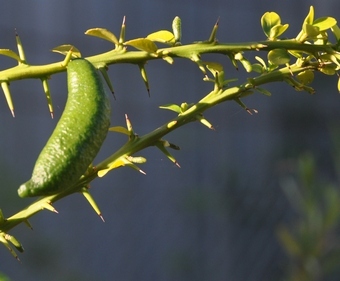 They are thorny and produce fruit similar in size and shape to a finger. The fruit coloured from green to dark brown has a thin skin, and contains juice vesicles now known by chefs as "lime caviar". They taste like a lime with some mandarin overtones. It is grown much like other citrus species with regular watering and feeding.